The Hyundai Santa Fe is undergoing a major overhaul for 2019. This model, now entering its fourth generation, actually replaces the Santa Fe Sport while the Santa Fe of 2018 is being rebranded the Santa Fe XL. Meanwhile, Ford is doing something similar with its Edge Sport, now known as the Edge ST. All other Edge trims are changing too as they enter the second generation for this popular model. In this comparison guide, we see how these two redefined SUV models measure up. Standing out in this crowded class takes some doing. While the frame of the Santa Fe and Edge are similar, the details help the Santa Fe stand out. The first distinguishing feature is the grille. Its design, which Hyundai has dubbed 'Cascade,' looks like waves and really makes the Hyundai logo pop. The upper headlights of the Santa Fe are mean and narrow while the lower beams are held close to the body, solid, and strong. The rear view shows a varied surface with solid red taillights, double right-side exhaust, and reverse lights separate and lower. The 2019 Ford Edge, by comparison, is plain. Not much changed design-wise during the refresh, except a wider grille and LED lights. The Edge still looks very much like others in its class. The hexagonal grille is understated, while its front and rear bumpers are standard. The Edge is attractive, but with a play-it-safe styling. The design on the Santa Fe is more imaginative, an important characteristic that sets it apart from so many contenders. Let's talk about the elephant in the room. How much do these overhauled SUVs cost? 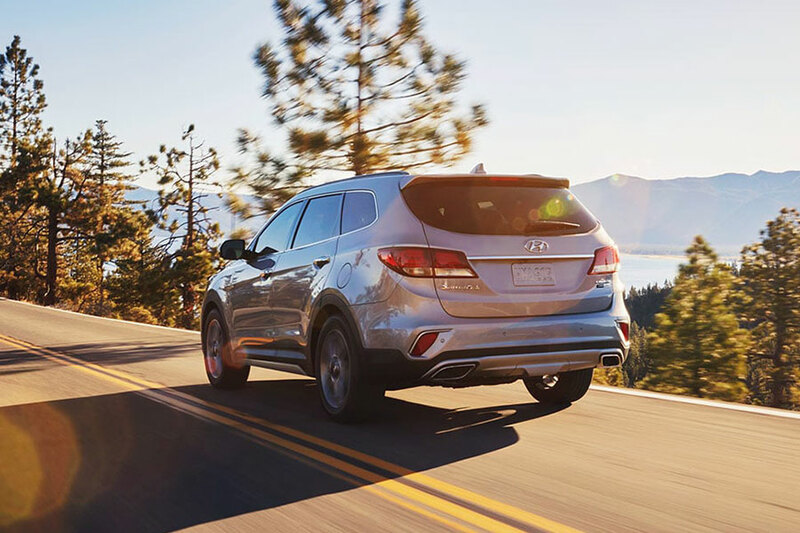 The 2019 Hyundai Santa Fe starting price comes in at just over $25,500 for its lowest trim while the base level 2019 Ford Edge costs almost $5,000 more. That's enough of a price difference to make it worth your while to get the Santa Fe, so long as its other features are up to par. At the other end, the 2019 Hyundai Santa Fe is expected to top out at over $40,000, fully loaded. The equivalent top-trim Edge ST, with all the options, will cost upward of $52,000. Do you get what you pay for or is there real value in the Santa Fe? Keep reading to find out. One of the most important characteristics of a people hauler like these SUVs are safety ratings and features. It's too early for crash test ratings for these redesigned SUVs, but we do know the active safety features each one will offer. The 2019 Hyundai Santa Fe offers a huge assortment, including airbags, forward-collision warning with automated emergency braking, lane-departure warning and lane-keeping assist, driver-attention warning, automatic high-beams, rear cross-traffic alert, and blind-spot monitoring with avoidance assist. These active safety options have become more common, but the Santa Fe has two new features that might knock your socks off, if you're a safety enthusiast. Safe Exit Assist keeps the doors locked if it detects oncoming traffic. That way, you won't step into the path of a car or bike or have the door taken off its hinges. There's also Rear Occupants Alert that alerts the driver of motion in the back seat, a feature that directly addresses safety concerns for those carrying children in rear-facing car seats. The 2019 Ford Edge has really stepped up its safety game too. Automated emergency braking, forward-collision warning, blind-spot monitoring, lane-departure warning, lane-keeping assist, and automatic high-beams all come standard now. There's also evasive steering-assist feature and adaptive cruise control that can bring the Edge to even a full stop. While these two SUVs have a similar set of safety features, the lower overall price point of the Hyundai Santa Fe gives it the win for us.